It had been reported on March 25 that Matondkar's name was being considered by the party high command. 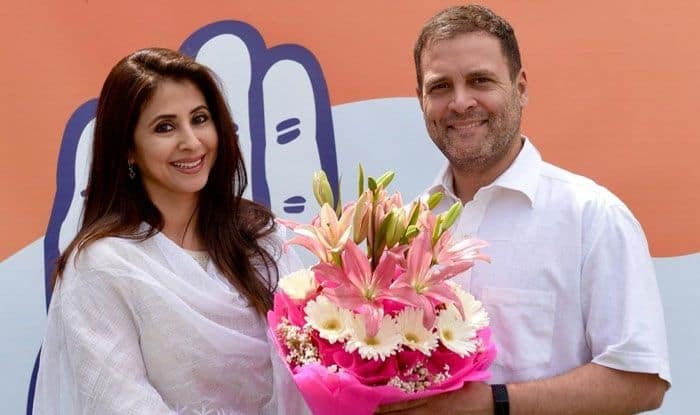 Ending all speculation, famed Bollywood actress Urmila Matondkar joined the Congress in the national capital on Wednesday afternoon. Matondkar, 45, who shot to fame as a child star in Masoom (1983), is likely to be named the Congress candidate for the Mumbai North Lok Sabha seat. It may be recalled that IANS had first reported on March 25 how her name was in “an advanced stage of consideration by the party high command” and the final decision would be announced shortly. If nominated, Matondkar’s formidable rival would be Bharatiya Janata Party incumbent MP Gopal Shetty in the constituency, which was once regarded a BJP bastion. However, it was Bollywood actor Govinda (Ahuja) who had earned the title of ‘giant-killer’ in 2004 when – in a major upset – he trounced former Union Petroleum Minister Ram Naik, who is now the Governor of Uttar Pradesh. In 2009, Naik had faced his second consecutive defeat, this time at the hands of the Congress’s Sanjay Nirupam. But, in 2014, Nirupam was defeated by Shetty during the BJP-wave which catapulted Narendra Modi as the Prime Minister. The name of Matondkar, 45, married to a Kashmiri, MA Mir, has been doing the rounds since the past few days as the Congress grappled for an effective counter to the BJP. Starting her film career as a seven-year old child star in a Marathi film, Zaakol (1980), she later got her first role in Bollywood in the Shashi Kapoor-Rekha starrer Kalyug (1981). But, it was the highly-acclaimed Shekhar Kapur-directed film, Masoom (1983), that catapulted her to fame and significantly boosted her film career. Later, she worked with some of the biggest actors in major films like Dacait, Bade Ghar Ki Beti, Narasimha, Chamatkara, Aa Gale Lag Jaa (opposite Jugal Hansraj, the child co-star of Masoom), Rangeela, Indian, Judaai, Daud, Satya, Kaun, Mast, Dillagi, Khoobsurata, Jungle, Pyaar Tune Kya Kiya, Ek Hasina Thi, Om Jai Jagadeesh, Bhoot, Pinjar, Maine Gandhi Ko Nahi Maara and Speed, among others.